Remember the public split between Apple and NBC a few months back? NBC wanted to jack up the prices for TV show downloads via iTunes from $1.99 per episode to $4.99. In response, Apple announced that it would not be selling NBC television shows for the upcoming television season in iTunes. NBC & Apple’s agreement ends in December. 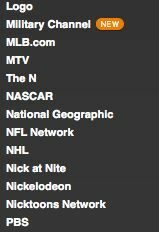 As a result, NBC and affiliated NBC Universal channels are no longer listed at the site (right). Paid downloads of TV shows have failed to make much of an impression with digital media fans, despite the runaway success of iTunes’ music store. The mediocre resolution of current video downloads may turn off some buyers, while others balk at the idea of paying for content that was originally distributed for free.